Crossline laser levels will project an incredibly bright vertical or horizontal or cross line onto any flat surface generally with an accuracy of around a quarter of an inch at 30 feet (Source). Crossline lasers are designed for a variety of different purposes including aligning tiles, performing wall studding, perfectly hanging a series of large paintings, and general contractor and home repair tasks (Source). The Hammerhead HLCL01 is our top pick. It has three different laser modes that include cross-line, plumb and level. It also has a self-leveling functionality and includes an adjustable clamp. The general user consensus is that it is a high-quality, simple to use, and inexpensive option that includes well-made accessories and batteries. A real rarity. This is probably the best value by of the bunch- as the DeWalt is several times as expensive and comparably rated by users we spoke with. That said, let's take a look at five of the best-selling cross line lasers on the market today and see how they compare. The Hammerhead HLCL01 is a very compact cross line laser level that is simple in design and has features that many users all agree are great for ease of use. One key feature that many users enjoy immensely is the accuracy factor of +/- ¼ inch at 30 feet and better yet this cross line laser will self-level whenever it is within just four degrees of level. Most users love the idea that it has its own adjustable mounting clamp for times when their hands may be busy with other things. Users also have commented on how much they enjoy its sleek and lightweight design making it extremely easy to use. This cross line laser also has just two controls making it simple to use with a top button that will toggle between the crosshairs, the horizontal line as well as the vertical line of objects being worked on. The other control is used for balancing and stabilizing. Many customers like how durable this compact self-leveling cross line laser is as well, some users admit to dropping it on several different occasions with no adverse effect on its performance. There does seem to be one issue that bothers some users and that is the cross line lasers inability to adjust for height. 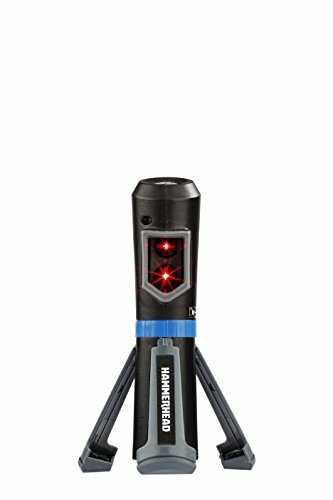 This cross line laser level by Hammerhead has a variety of nice features that users enjoy having on this tool such as its ability to give off a bright laser line at 360 degrees both horizontally and vertically. 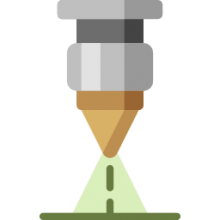 It will also do cross lines onto different surfaces. This cross line level has the ability to give the user a laser line that will provide all-around leveling up to 60 feet in diameter. 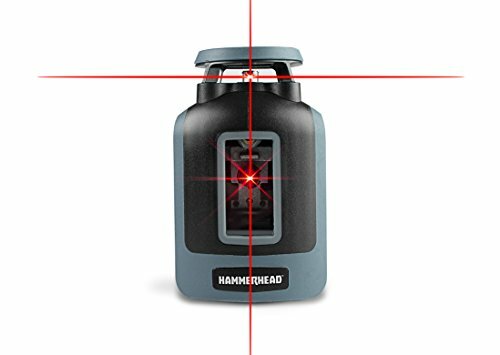 Another thing that users really like is that this cross line laser by Hammerhead will self-level itself when it is positioned within four degrees of level. Another convenient feature of this cross line self-leveling laser is that it has an LED indicator light that will turn red when the cross line level is positioned outside its self-leveling range. A cool feature many users love is that in its manual mode the Hammerhead cross line level can be placed in a position to project laser lines that are not positioned level or flush for those projects that might require this type of line. 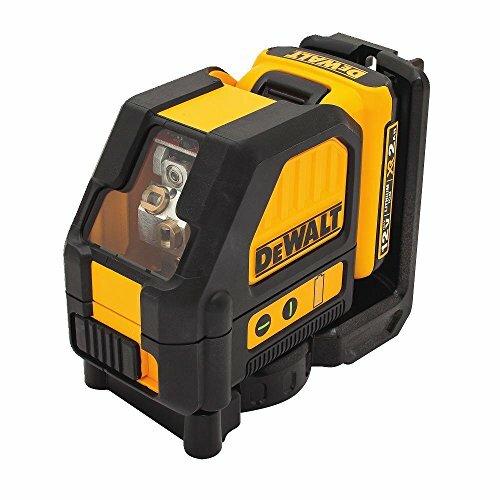 The DeWalt DW088LG 12V Cross line laser has a few unique features that other cross line lasers don’t have that users are enjoying and that is the green beam laser technology which is about four times brighter than the traditional red beam of light most cross line lasers have. They also enjoy the feature that when the batter is low the laser will stop working correctly with a flickering light as a warning. Another good feature many users have commented on is that it has an over molded housing that helps to protect it from water and debris. Users also like the fact that this cross line laser has a very thin laser line that can be seen even in a very bright room. This cross line laser appears to be very well constructed with a lot of thought put into its design. One drawback for some customers is the fact that it is a tad expensive compared to some of the other cross line lasers on the market. 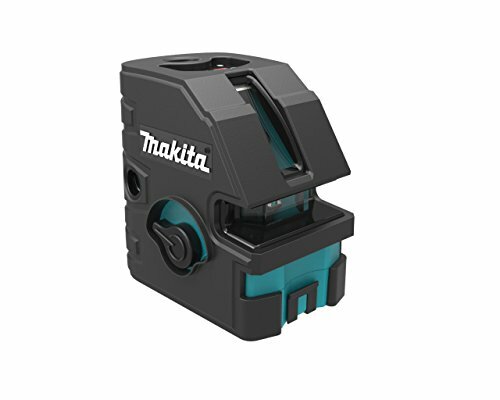 The Makita SK104Z cross line laser level has a few features that users have been happy with and that would be its fast self-leveling time which can be achieved in just three seconds which helps with the user’s productivity. The self-leveling feature of this cross line laser is correctable up to 4 of slope which allows for better operation on more uneven surfaces. Users also liked the accuracy of this cross line laser with a +/- 1/8 inch at 30 feet for the horizontal line and a +/- 3/32 inch at 30 feet for the vertical line. Some users of this cross line laser found that changing the mode from vertical to horizontal was sometimes difficult and can be quite frustrating at times. Some users also felt that it didn’t work as well trying to find a point location from floor to ceiling as some other cross line lasers on the market. 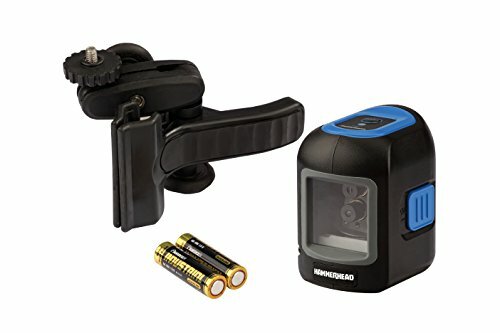 This Hammerhead cross line laser level is one that users like due to its compact size and the convenience of its own tripod stand, a feature many other cross line lasers don’t have. Another feature users pointed out that they liked the convenience of is that it has its own belt holster so it can be worn on the user’s belt or it can be placed in the users pocket. This cross line laser also has a nice warning feature that users enjoy and that is the power button will turn red if the user does not have the cross line laser level on a flat and even surface. Some users of this Hammerhead cross line laser, however, felt that the tripod legs on the unit are not sturdy and are of poor quality. Some users feel that this inexpensive cross line laser is best suited for a homeowner and not the professional. If you're looking to purchase a cross line laser, you may be a carpenter or a contractor who needs a quality device to project brightly articulated lines to help you perform different types of leveling and layout responsibilities. Some users really enjoyed the walking pendulums that accompany their crossline lasers. Sometimes the case is a little bit larger than they would like, but the added room, in the example of the DeWalt cross line laser, lets you store additional batteries as well as the charger and laser itself. Many users who have neglected purchasing one of these devices until now report that they cannot believe how much easier their carpentry and home-building tasks are. If you are looking to purchase a cross line laser, read our reviews on this page and peruse our comparison table to get a sense of the best options on the market today.